Talking Creatures, and one or both adapter(s) shown below. Plug in your speakers, Talking Creatures and your CD player then click on proper link below. 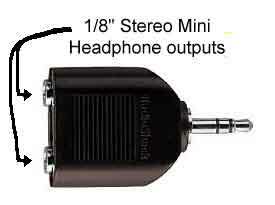 If your CD player has headphone output only you will need both adapters shown. 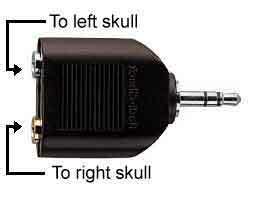 If you have two outputs on your cd player you only need one adapter below. you have CD player with two outputs, one line out and one headphone output. you have CD player with one headphone output only. Click here to see video of a pair of Skull Lamps in action!